We are a leading Exporter of casual ethnic salwar kameez, designer cotton anarkali readymade suits, cotton anarkali for festival, readymade cotton anarkali suits and latest cotton chanderi suits from Chennai, India. We are the Leading Supplier,Trader,Exporter and wholesaler of Casual Ethnic Salwar Kameez in Chennai,Tamilnadu,India. We are the Leading Manufacturer,Supplier and Exporter of Designer Cotton Anarkali Readymade in Chennai,Tamilnadu,India. We are the Leading Manufacturer,Supplier and Exporter of Cotton Anarkali for Festival in Chennai,Tamilnadu,India. 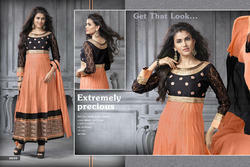 We are the Leading Manufacturer,Supplier and Exporter of Readymade Cotton Anarkali. Our offered suits are designed by skilled professionals using finest grade fabric that is procured from the most reliable vendors of industry. The entire ranges of suits are provided with traditional and timeless elegance. We offer these suits to our valuable clients at rock-bottom prices in different designs and sizes. We are the Leading Manufacturer,Supplier and Exporter of Latest Cotton Chanderi Suits in Chennai,Tamilnadu,India. Looking for Readymade Cotton Anarkali Suits ?